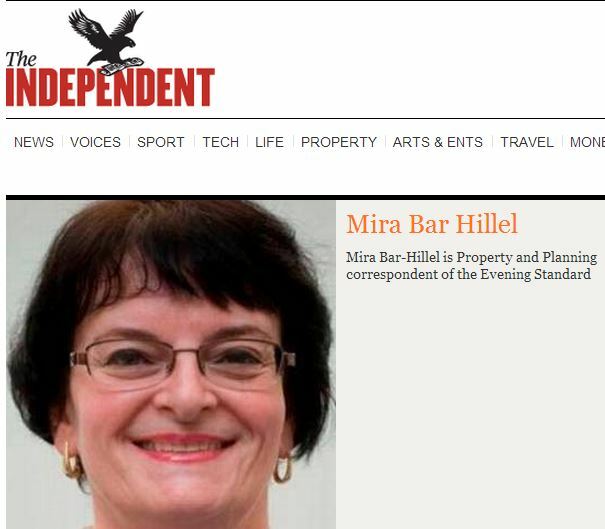 Mira Bar Hillel is Property and Planning correspondent for the Evening Standard. And, though she is Jewish, she is also prejudiced against Jews. In fact, Jews scare her quite a bit. She also recently complained, in a column at The Independent, that Zionist Jews try to gag her into submission. My most vicious Twitter trolls are Jews from all over the world accusing me of treason for daring to criticise Israel’s racism and other excesses and trying their best to gag me. Since arriving in London I have not ONCE experienced anti-Semitism, although jews talk about it a lot, as Marcus said. I am not a self-hating jew – I hate people who use the label to gag into submission any critic of Israel and its deplorable actions. And very effective they are too. Yet, somehow, Bar Hillel evidently hasn’t been effectively muzzled by the British Jewish community, as her recent column at The Independent (Israel and the US: Drawing up lines of allegiance, Oct. 30) demonstrates. Ask British Jews whether they feel more loyal to this country or to Israel – and expect to be instantly labelled anti-Semitic and sent packing. The same, only more so, applies in the USA. According to the IAC, this expansion is to be sponsored by Vegas casino billionaire Sheldon Adelson. Bar Hillel fails to note that the head of the umbrella organization of American Jews denounced the questionnaire as well. In October 2013 Adelson called upon the US to warn Iran it would use Nuclear missiles if necessary, initially aimed at the desert and subsequently threatening to hit Tehran if it did not halt its nuclear programme . This could have been – and possibly was – scripted by Netanyahu. I wouldn’t dare ask Sheldon Adelson, whose wife is Israeli, where his allegiances lie. But I would dearly love to hear his answer. No, Bar Hillel “wouldn’t dare ask” the question she in fact just asked, about the loyalty of Jewish Americans, just as I wouldn’t dare ask editors at The Independent how they reconcile their recent defense against charges of antisemitism with their decision to publish a column evoking the charge of ‘dual loyalty’ by a writer who has admitted being prejudiced against Jews. But, ‘I would dearly love to hear’ their answer. She has said she’s prejudiced against Jews, and now she’s proven it…again. Well we can’t gag her since her right to spew blood-libel about her own people is protected by Freedom of Speech. We can and have the right to criticize her and set the record straight when she lies. This whole “Jews are trying to gag me” act is a rather poor attempt to silence critics without responding to valid criticism. Israel racist? Against Jews maybe. I spent 10 years in Israel and discovered they were much more enthusiastic about persecuting Jews. So alas, she is just like an Israeli. She said the truth, she hates the Jews and not herself. While most kapos during the Holocaust were ordinary people with average character weakness who found themselves in extreme circumstances and weren’t able to face with them, certainly there were some volunteers too – like this narcissistic psychopath. Why would any of us wish to stop the woman from embarrassing herself. Everyone knows that those who disparage their own are not to be trusted. She does a good job of self exposure. Perhaps Ms. Bar Hillel could advise me where my allegiance should be. I elect people to the National Assembly for Wales, who form the Welsh Government. I also elect people to the UK Parliament, who form the British Government. And I also elect people to the European Parliament, who enact legislation and have some oversight over the European Commission. Now there are times when decisions of these three levels of ‘Government’ are in conflict. And as I am Welsh, living in Wales but also a citizen of the UK and a citizen of the EU, tell me Ms. Bar Hillel where should my allegiance be? I am British. Born and bred. I am also Jewish. I am absolutely clear. I love both Britain and Israel (and I have a soft spot for various other countries too). Fortunately I can love both without any fear of “disloyalty”. What’s wrong with that? Should Britain ever act directly agaisnt Israel’s interests, I reserve my democratic right as a citizen to express my disagreement with such actions and to do what I can to change said British policies. What is wrong with that? It is no different from an environmentalist who forcefully proposes investment in wind/tidal energy, when on a cold economic view, that may not be the best thing for this country (at least un the short-medium term). Remember Norman Tebbit and his “cricket” remarks about (i.e. agains) Asian Brits supporting sports teams from India/Pakistan? His comments were rightly dismissed as classic Tory crap. Is Bar Hillel aware of how much she sounds like Tebbs? Even worse, of course. Her smile makes me shudder. So either there’s something wrong with the Jews of today, or something wrong with Mira Bar Hillel. Gosh, really difficult to come to a conclusion on that one! However, the fact she finds it impossible talk to her relatives provides a tiny clue. Shame on the Independent for exploiting this obviously damaged woman. When has Netanyahu ever threatened to nuke Iran??? Bar Hillel’s rambling rants remind of Ben White’s, i.e. as if posted from another planet. I have to say I am uncomfortable with the posts on this thread which comment on Bar Hillel’s appearance. What she looks like is irrelevant. It is her views and how she expresses them that makes her repellant. Would they be any more palatable if they were spouted by Bar Refaeli? Thanks, Adam, for removing the offending messages. It’s not the looks she was born with but what she does to them that tells a story – expression funny fringe etc. She could of course do to them what Bar Rafaeli does with what she was born with and then everyone would woo her.